Dean Austin Quigley will be honored for his distinguished service and accomplishments on Thursday, November 13, when the Columbia College Alumni Association presents him with the 2008 Alexander Hamilton Medal at the American Museum of Natural History in New York City. This year’s Hamilton dinner will be larger than any other, necessitating a move from its traditional venue, Low Rotunda, to the museum. Dean Austin Quigley In May, Quigley announced his decision to step down in July 2009 after 14 years as Dean of the College, longer than all but one of those who preceded him — Herbert E. Hawkes served as dean from 1918–1943. Quigley will continue to teach and do research as the Brander Matthews Professor of Dramatic Literature and also will serve as special adviser to the president for undergraduate education after stepping down from the deanship. “Fourteen years is a remarkable tenure in any academic leadership role, and Austin has presided during an era of extraordinary transformation at the College,” said President Lee C. Bollinger. Quigley has spearheaded remarkable progress at the College, as reflected in admissions statistics, facilities renewal, fundraising levels, faculty investments, curricular innovations, student achievements, financial-aid upgrades, student services enhancements, alumni program initiatives and more. There has been a vast upgrading and expansion of student services and a concurrent growth in alumni relations and development, as reflected by increased attendance at events, greater than three-fold growth in College Fund and Parent Fund giving, and development of a Senior Fund that this year set a record with 85 percent participation. There also have been significant investments in faculty enhancement and expansion as well as in curricular innovation, including the addition of “Frontiers of Science” to the Core Curriculum. During Quigley’s tenure, there has been the largest upgrade in College financial aid in history. “The fundamental responsibility of any dean of the College is to leave the institution in better shape than one found it, and I have sought every year to pursue that goal,” observed Quigley. Born in Northumbria, near the English border with Scotland, Quigley earned his bachelor’s in English literature from Nottingham University, his master’s in linguistics at Birmingham University and his Ph.D. in English and comparative literature and literary theory at UC Santa Cruz. 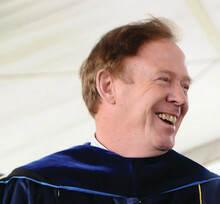 Before coming to Columbia in 1990, Quigley taught at the University of Massachusetts and the University of Virginia, where he chaired the English department. He also has taught at the University of Geneva, the University of Konstanz and the University of Nottingham. At Columbia, Quigley established the undergraduate major in drama and theatre arts, revived the doctoral program in theatre and helped reinvigorate the M.F.A. program in theatre at the School of the Arts. He served for three years as chair of the Lionel Trilling Seminar series and has continued to teach and write during his term as dean. For more information on the dinner, contact Jennifer Shaw, associate director, special events, in the Alumni Office: 212-870-2743 or js3417@columbia.edu.